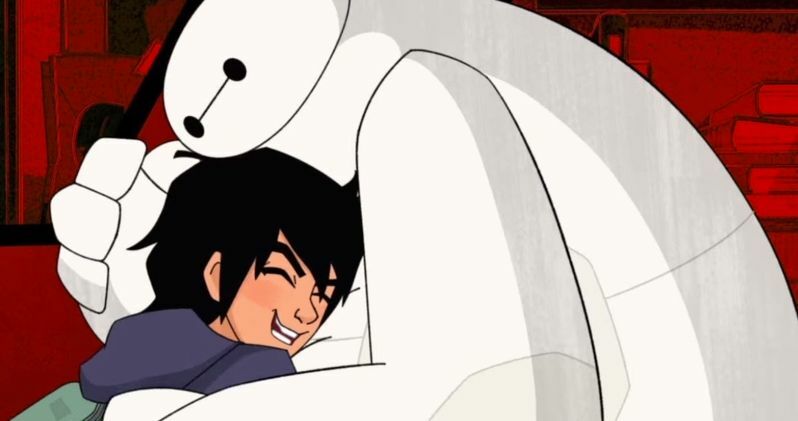 Are you ready for some more Baymax in your life? Of course you are! Because Baymax is awesome. You're in luck. Disney has just released the opening title sequence for the upcoming animated Big Hero 6: The Series, which is set to debut on Disney XD this fall. The title sequence is just as great as everyone who loved the movie might hope it would be. The Big Hero 6 opening title sequence was revealed during the Ducktales panel at D23 as a rather unexpected surprise. The footage gives us a good look at the animation style we can expect from Big Hero 6: The Series, which will pick up right after the events of the 2014 animated movie. There is a nice little montage of everyone using their superpowers and a pretty catchy tune to go along with the opening sequence. Also, you get to see Fred and Baymax dancing with an inflatable tube man. What more could you want? In Big Hero 6: The Series, Hiro is the new kid at San Fransokyo Institute of Technology and faces daunting academic challenges at the prestigious "nerd school" and the social trials of being the "little man on campus." Fortunately for him, Hiro has his brains, his ingenuity and his best friend Baymax to help him find his way. But off campus, things get dangerous. Hiro and neat freak Wasabi, bubbly mad scientist Honey Lemon, fanboy Fred and no nonsense Go Go form an unlikely, but awesome superhero team Big Hero 6. Together they face madness and mayhem as a wide array of science-enhanced villains threaten San Fransokyo. The series will see most of the stars from the Big Hero 6 movie returning, but a couple of the roles have been recast, such as T.J. Miller, who originally voiced Fred. Apparently, he couldn't be bothered to come back. Big Hero 6: The Series features Maya Rudolph (Aunt Cass), Jamie Chung (Go Go), Scott Adsit (Baymax), Ryan Potter (Hiro), Genesis Rodriguez (Honey Lemon), Khary Payton (Wasabi), Brooks Wheelan (Fred), Alan Tudyk (Alistair Krei), David Shaughnessy (Heathcliff), and Stan Lee (Fred's Dad). Yes, as in Marvel Comics legend Stan Lee. Excelsior! Disney has not yet announced an exact premiere date for the series yet, but they have a lot of faith in it. Disney XD has already ordered a seconds season of Big Hero 6: The Series, which is a very good sign for those who loved the Academy Award-winning movie. Given that the movie made $657.8 million at the box office and that it has an 89 percent approval rating on Rotten Tomatoes, there are an awful lot of people who love Big Hero 6. Be sure to check out the opening title sequence from Big Hero 6: The Series for yourself below. We will be sure to keep you up to date as more information on the series is made available.